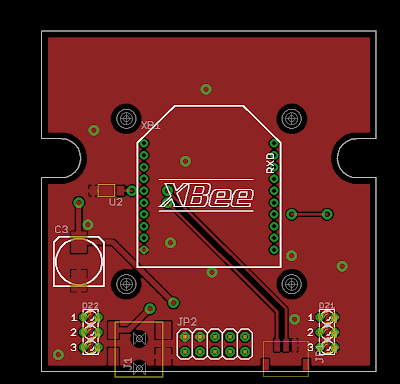 I'm including the schematic for the transmitting XBee (the black box seen in the video with the blinking LEDs). Really, it is quite simple. 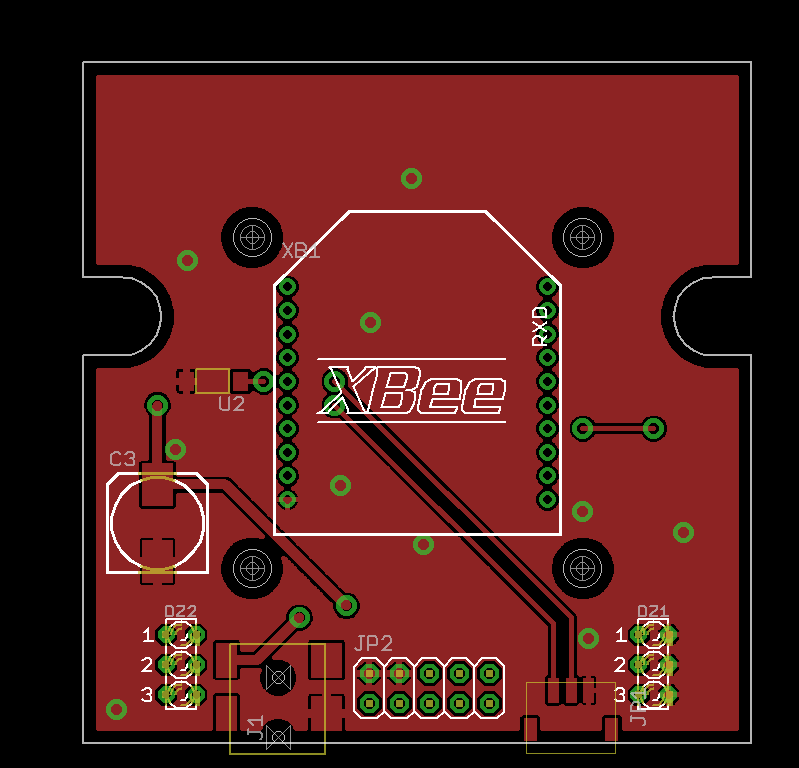 This is the board layout for the transmitting XBee (black box). 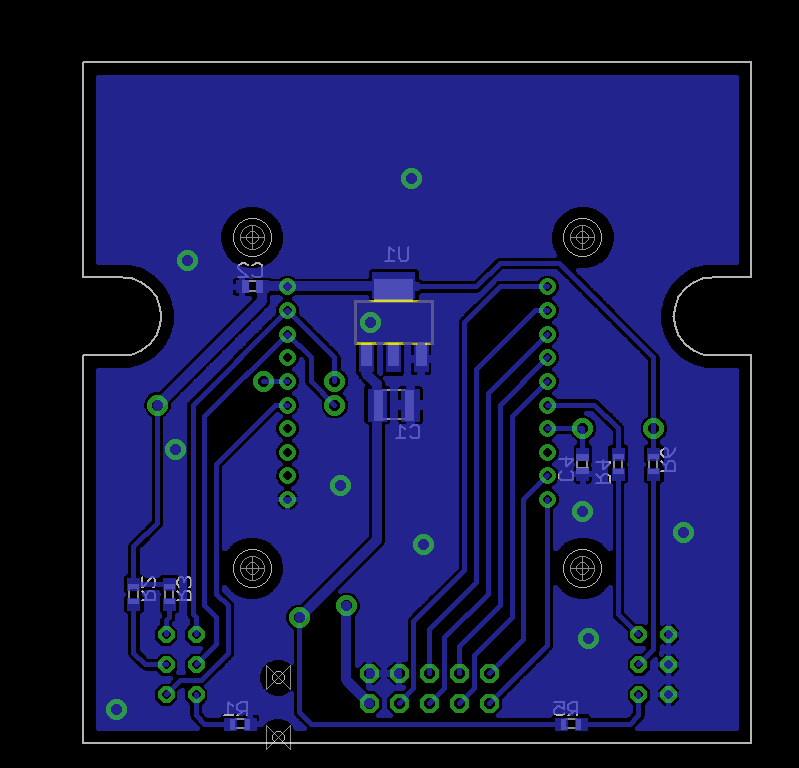 All the joystick outputs are routed to the ADC and GPIO pins of the XBee, like the schematic shows. // control 2 servos, throttle and rudder (steering). // for this program this will always be 1. // Start serial port at SERIAL_BAUD bps. // Let's parse us an XBee sample packet! // packet has been received. Which motor you have used here??? and how you are controlling your "Direction Plate"???? But i am wondering about what is within the black box( transmitter )? There, I updated the post to include the board layout of the black box. The schematics for the black box are included. That is the really neat part, there is no additional microcontroller connected to the joystick. 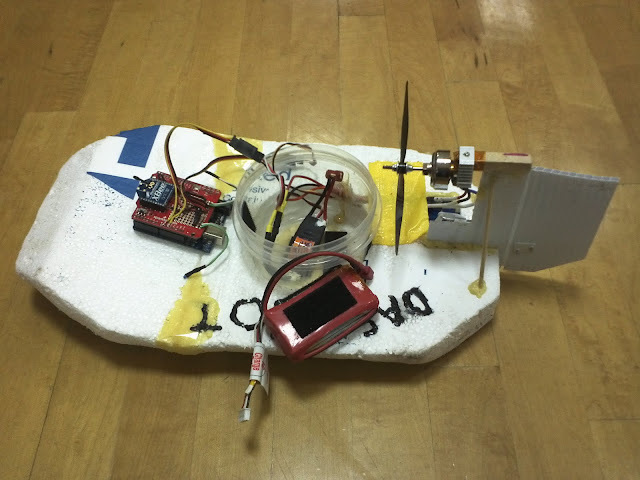 The XBee uses its ADCs and GPIOs to gather data and automagically send it to the Arduino. Hi again, I complettly understan everithing on the left side of de schemics of the black box, but, what are the lonly thins on the right, one loks like a voltage divider or something, and the other leds an stuff by their own...? I realize there could be some better markings on that schematic. 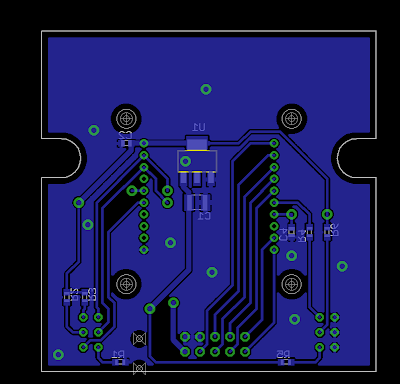 U1 is a 3.3V voltage regulator, hence the 5V in and 3.3V out. There are two status LEDs, one for 5V to tell that the board is powered, and one for 3.3V to tell that the 3.3V regulator is working. Then, on the far right there is a DC barrel connector jack, which is where you plug in the 5V in. I was wondering how your sketch works when you never include the xbee library at the beginning. There are other xbee receiving commands that I see in the Xbee examples of RX that aren't included either. Have you updated this sketch ? If so can you upload it ? I'm trying to do what you seem to have done. The entire sketch is there. I actually don't use the XBee library. It manually parses the packets from the serial port. I'm not familiar with the XBee library, but it might offer a simpler solution. I set up two servos and have 2 xbees that communicate packets and you're sketch didn't work for me. Nothing happened. You must have the controller connected to a PC. I was trying to use a stand alone pot connected to a power supply and xbee as the remote. Arduino is on the receiving side with receiving xbee. You must configure the XBee connected to the joystick to automatically sample the ADCs and send the samples to a specific address. I cover this in Part II. If you are not receiving anything with the arduino it must be an XBee configuration problem. Not true. I can see packets just like in your Part II. When I move the joystick connected to the transmitter Xbee, the X-CTU hex values change accordingly to the designated pin used on the receiving Xbee. Your sketch is not decoding my packets. Can you correctly manually decode the packets and verify that the XBees are in API mode and that both have the correct baud rate? If you post the stream of what you are seeing through X-CTU, I can try to take a look at it and try to tell if the incoming data to the XBee is correct. Something is not right with that packet. It almost looks correct. It is sending ADC readings for A1, A0 and shows that DIO 2 is enabled. However, what you posted is not a complete packet. It shows that the length is 0x0012 (decimal 18) and there are only 14 bytes following the packet (if you assume the last byte is a checksum). In addition, the last byte is not a valid checksum. The sketch is probably determining that it is not a valid packet and discarding. It is possible that the API definition has changed, which I will check. Which XBees are you using and with which firmware? Packet I received today above. The other I had written down from before. That looks like a better packet. I've used the 10ED firmware series 1, so there shouldn't be anything weird. I skimmed the .pro files, and I don't see anything strange with them. Also, do you have any indication that the arduino itself is receiving the serial data? What xbee shield are you using? The sparkfun shield has a switch to change which pins to use. The non-uart pins don't support very fast baud rates. One last question, which arduino are you using? I don't have indication that the arduino is receiving serial data. Using pins 2 and 13 for Xbee RX/TX. Have tried other pins with no success. Which pins should you use for the data in this case ? I have verified communication with the Xbee and the Arduino board via pins 0-RX and 1-TX using Arduino's Serial Monitor. I had to use another program online that I could understand to change the packet length to 18 instead of 22. If I could get the values to be between 0-1023 where around 500 is the neutral position, I think I can handle the rest of the programming. I just don't know how to program that. Unfortunately I don't understand your code. This is the sketch I used to get the data through the Arduino successfully. I understand this one. Still reading that only 1.2V can go to an ADC pin on Xbee. This is my exact setup. This sketch almost works. I'll probably just go with Esplora and Xbee. No decoding.....that's my problem. Changed baud rate originally and didn't work. I enable 2 more pins on each Xbee and the packet stays the same size. Why doesn't it ever get more than 18 bytes ? The byte count will only increase with ADC pins enabled. Digital pins get lumped into a bit field in the first two bytes after the bytes signaling which pins are included in the sample. The sketch in this post counts which ADCs are enabled and reads in the appropriate values, regardless of length. I really appreciate all the work and the fast responses you have given people on here. and thanks everyone for asking questions... your work helped me grasp API's a little better then I have before. I still feel like I'm missing something... especially with your sketch. (you lost me in a few parts there.) but overall you did an amazing job. Hi Everyone, Its been a long time since anyone posted on this page. I just found this project and its really cool. I got everything working after a little digging through the previous posts. Having the correct baud rate helps :) I have a questions that I hope you can help with. When I run this I get both the throttle and rudder servo working at the same time? Only one Axis works and it moves both servos at the same time. I have one in Pin 9 and one in Pin10. How is this possible? Last question is do I need to make any connections on the sparkfun board other then Pins9,10 and the power for the servos. I see in your pic you have other wires and you use the open space to make connections. Do I have to do anything with the D0 and D1 pins from the Xbee. Do they go into anything? I had them go into Pins 1 and 2 on the Uno board but even w/o it the servos still act as one? Maybe you can post a picture or drawwing of the proper connection on the UNO. Thanks!!! Did you use the code verbatim? Or did you make some mods? If you post the modified code I can try checking it out. Are you writing the same value to both axis? If not, are you parsing the individual packets from the xbee correctly? My xbee board has some thermsistors attached to it, so you can ignore the other connections. All you need is 5V for the servos, the PWMs to Pins 9&10, and GND. Thanks for getting back to me. I found the issue and it was with the way I hooked up the joystick to the Xbee. In your instructions, you mention using D0-D3 for the joystick inputs, so when I hooked up the joystick I started with D0 and D1. The Arduino code is looking at 1 and 2 not 0 and 1. I made the Xbee ADC inputs match the code and it works great now. If you just want to connect a joystick to an arduino and then spit out the proper signal to the trainer port, it should less complicated than this with the XBee. Have you already got the joystick hacked so that you can read the pot values from the separate axis? The tricky part will be combining them into a single channel that the trainer port understands. The regular Arduino PWM libraries can't do that, so you'll probably have to bit-bang it out (which can be a little tricky). I like the idea of having a proper joystick for FPV. Im working on a wireless robot controlled car and I just cant seem to get a simple led to flash with my arcade joystick 4 micro switches and Xbee S1 modules, I have looked at 25 examples on how to hook it up and just cant seem to grasp it, I have configures the Xbee using XCTU and I can talk to both of the xbees through the terminal port. But when it comes to simple joystick to work cant get it. Do you have a log or blog of your project? If you have some documentation of what you've attempted somewhere, I'd be happy to check it out. Well, i want to know somethings, first before saying those things, I loved this idea, it could help me in my robot. First thing, i know this could be out of the topic but, how you made in the video the part containing the motor move left and right (you use another motor or what?). Second thing, which black box in the video you are talking about, the one in the joystick or something in the Das Boat? Third, code for the arduino or joystick? Fourth and final (I think), in the old parts, you set up the Xbees (Both i think) so how you connected the Xbee to computer (laptop..etc)? The Joystick is read directly by the XBee's ADC and Digital input pins, so no Arduino or computer is required for the joystick. the code for the receiver is listed above and works well. no code needed for joystick. you need an adapter to connect the XBees to anything, and some way to talk to it via serial, USB. Sparkfun and Adafruit both sell XBee breakout boards and both companies probably sell XBee to USB boards. Hi, I found your post (that is quite old) but still, very interesting, great video! thanks for taking the time to add so much details to your explanations. I wonder if you can start with the actual setup but adding a mechanism to convert the whole system as a by directional remote control. I am building a robot on which I intent to add telemetry so, It would be nice if on the joystick side, i can get data coming from the arduino. Thanks.